Swedish percussionist and composer is joined by a group of classical Indian and Swedish jazz musicians in a unique contemporary 'raga project' that holds on to the roots of Indian music while becoming completely contemporary. The label says: "Indian Ghazal and modern electronica in groundbreaking new combination." Says Sebastian Åberg: "Two things have been important to me during this process. First, that the origin, the raga, is handled with esteem. Secondly, that the actual musical meeting between east and west actually enhances the musical expression." Recorded in Goa and Stockholm 2004-2006. Indian musicians: Maruti Kurdekar, Pradip Sarmokadam, Shipra Nandy, Vasantrao Kadnekar, Dilip Gadekar, Manab Das. Swedish musicians: Sebastian Åberg, Ismet Demirhan, Tobias Ersson, Viktor Buck, Stefan Lakatos, Stefan Grapenmark, Jan Liljekvist. The first close contact with Indian music took place in 1998 for Sebastian Åberg, who earlier had been occupied mostly with rock and synth music behind the drums. He went to Panjim on the south Indian west coast to study tabla for the master Maruti Kurdekar. - I stayed for a year and during that time the idea of finding new types of meetings between classical Indian music and more modern western influences began to take shape, he explains. The studies at Kala Academy gave Sebastian Åberg an opportunity to do an in-depth study of the strict rules as well as the poetic freedom of classical Indian music - and his love for the complex and dynamic tabla grew strong. So strong that he two years later returned to India with recording equipment as only luggage. - I stayed for six months. During some intensive weeks, I recorded with local musicians. I used some basic ideas that I had prepared in Sweden for structure and inspiration. 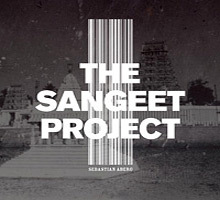 The Sangeet Project was thereby established. Since then, a lot has happened. Intensive studio work with production and additional recordings with Swedish musicians - on lapsteel and Turkish doudouk to name a few examples - has finally ended in seven tracks that Sebastian describes as music that preserves the traditional magic and structure of the raga, but with ”heavier beats and a more suggestive, electronic feeling”. - Two things have been important for me during this process. First – that the origin, the raga, is handled with esteem. Secondly – that the musical meeting between east and west actually enhances the musical expression, more than becoming a gimmick. At the end of September it’s time for Sebastian Åberg to prove his case. Two Indian musicians of world class, Maruti Kurdekar on tabla and the singer Pradip Sarmokadam, will then arrive in Stockholm to join forces with the Swedish musicians for the first time. The premiere live appearance at “Country & Eastern Nights” is scheduled for September 27th at the Ethnographic museum in Stockholm. That’s of course completely fantastic, Sebastian says smiling. I hope, and believe, that both the album and the concert also will show that it’s possible to create music that appeals to specialists on both edges as well as the modern people that stands in between.